Voted by Reuter’s / Trip Advisor as one of the top ten rental homes in North America, this custom Steamboat ski home offers true back door ski-in, ski-out access to the mountain. Located exceptionally close to the Thunderhead Express high-speed quad lift, Over the Edge Chalet is top-of-the line in all respects from its location to its many World-class amenities. This vacation home is a magnificent combination of traditional stonework with contemporary styling offering all you could want for a luxury mountain vacation in Steamboat. 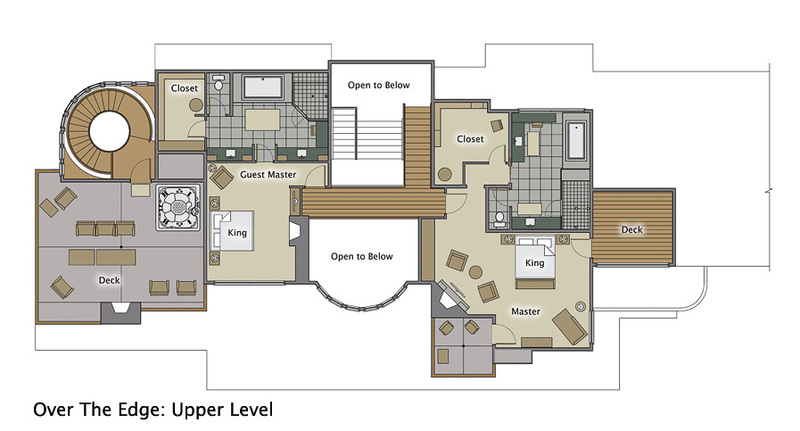 There are two spacious living areas on the main level that lead to the kitchen and dining area. This grand living space has 14-foot ceilings, a double-sided gas fireplace, and a slope side seating area. A fully equipped professional kitchen with appliances from Wolf and Sub-Zero awaits your chef. The large island offers a breakfast bar with seating for six. The breakfast table also offers seating for 10. With stunning views, the dining room offers a magnificent circular table that seats 12 guests. With 7 comfortable bedrooms large groups can stay in comfort. The master suites on the top floor have private bathrooms with infinity tubs and private fireplaces to delight in after a day enjoying all that Steamboat has to offer. 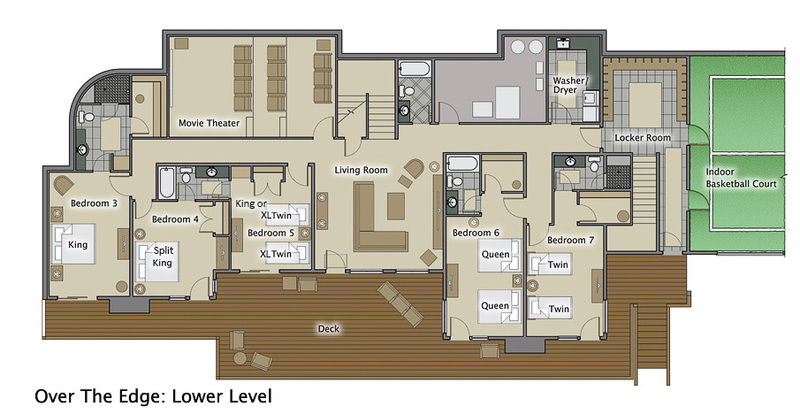 The remaining bedrooms are located on the lower level. Each has private access to the gigantic deck overlooking the slopes. There is a king bedroom, a bedroom with two queen beds and a room with two twin beds; all with their own private bathrooms. The last two bedrooms consist of a king room and a bedroom with two twin beds. These two rooms share a bathroom or have easy access to a bathroom just off the living room, next door. The game room on the main level features a bar with seating for six along with a pool table, poker table, shuffleboard, fireplace and two large LCD TVs. There is an audio system for the entire house. You can enjoy dramatic views of the Flat Top Mountains from the rooftop deck lookout. This is set up for year-round living with a gas fireplace and hot tub. 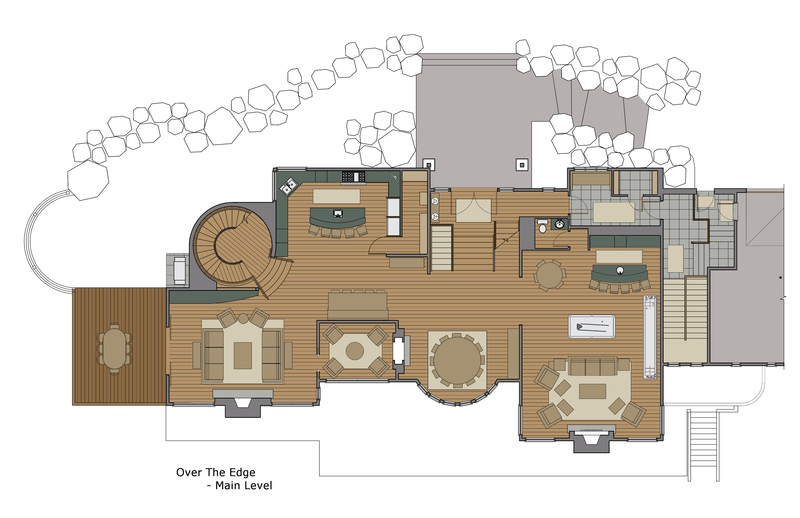 The downstairs has a third living area that has a 52 inch LCD, X-Box 360, Wii and PlayStation 3 video games for the kids. There is also a home theater with a 140-inch screen and seating for 16 in comfy leather recliners with room for more on the floor. Complimentary shuttle included for super-easy access to the ski trails.